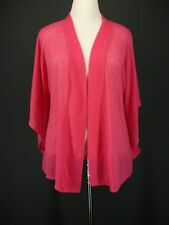 Details:A great open front cardigan in a longer length. A great piece to wear over leggings. Features include a V-neck; one-button closure; short sleeves; straight bottom hem with slits; and slinky, wrinkle-free fabric. Fabric: Acetate/Spandex. Length: 26 ½”. Shoulder: 15 ¾”. Partially sheer textured fabric. One button front. 48" bust, 26" back neckline to hem. Hand washable. 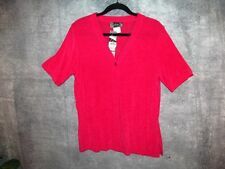 SLINKY BRAND Women's Open Front Cardigan Sweater Ruffles Sleeve Size PL large . Condition is Pre-owned. Shipped with USPS Priority Mail. Bell Sleeves. When machine washable, gently used clothing is laundered and pressed (when necessary). It will be clearly stated when an item has been dry cleaned. 1 Hook & Eye. Colors of item may vary slightly in photos due to viewing screens, lighting, editing, etc. Long sleeve. There are many colors and eye catching designs available. Open front. This sweater is versatile and easy to style. It is sure to give you a. to enhance the elegance of the wearer. Look your best wearing this sweater. The material is textured. No visible flaws and smoke free. Color: Tan. Bust: 56" Length: 32 - 37" Sleeve: 24". Bust: 50" Length: 27". 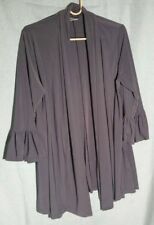 Ruffles 3/4 sleeve. Open front. Length - 31". Gr ea t co lo r an d st yl e. L oo se c ro ss b od y. 2 5” i n length. Ea sy Care an d verys of t.